Public sector procurement teams find themselves in the difficult position of having to balance economic austerity and the ever-increasing wave of outsourced services. While fidgeting for comfort in that usually uncomfortable place, they have to deliver strategies founded on increasing value for money and quality, while being transparent and open to audit in how they procure services. These coexistent tensions must surely strengthen the temptation to appoint ‘the usual suspects’, i.e. the incumbent trusted suppliers that will do all they can to keep bridging the gap between cost and quality, while also providing a wholly compliant tender. A procurement manager needs to be able to justify purchasing decisions, and a supplier that makes it easy to build the case for appointment will be well placed for success. This is where critical key skills come into play: the skill of new suppliers to outshine incumbents, and the skill of incumbents to demonstrate they can provide a greater scope of services at even higher levels of value for money. Did you know some of the legislation has changed? The Public Contracts Regulations 2015 came into force on 26th February, providing landmark legislation to shape how the public sector procures services. The Government-run Contracts Finder website is now used by all government bodies and local authorities to advertise contracts worth over £25,000. This threshold might be higher for some social services but the requirement still remains to advertise tenders. The use of prequalification questionnaires (PQQs) for low-value contracts has been eliminated by the new regulations, helping to simplify the procurement exercise for everyone involved. This is good because it means tender opportunities are becoming more available and accessible to a wider audience, including the numerous small-to-medium enterprises (SMEs) that bring invaluable skills and experience to a space otherwise occupied by large vendors. The previous Business Secretary, Vince Cable, stipulated that a quarter of all public sector contracts must be awarded to SMEs, helping to rebalance the supply market and drive competition and innovation. Public sector clients are allowed to seek pre-procurement advice from the supply market, enabling discussion about the most appropriate procurement strategy and informing the market of opportunities. This has helped to improve access to tender opportunities for SMEs and has enabled more realistic prospects of success for smaller businesses. This is good news for you because it gives you the opportunity to discuss the project early and find out as much as you can before the client issues the tender to the market. The access to public sector tender opportunities may be improved further by breaking projects into lots, which isn’t required but can be a useful strategy for both client and suppliers. Also, the new Innovation Partnership procedure facilitates better services through innovations developed collaboratively by the client and the suppliers. This is another way in which SMEs’ fresh ideas and experience can be brought to the fore. During our networking with businesses in all sectors, we meet people who say bidding to the public sector is rather pointless because the clients already know who they want to appoint. We can’t say if that’s true or not – surely, it depends on the procurement team involved and the specifics of the project – but we do know that you’re well advised to set yourself up for the best chance of success. There are some surprisingly common-sense issues to bear in mind. Working together, Mercury Communication & Strategy and SR Consulting recently worked with a public-sector client, bidding to provide services for supporting victims of crime on behalf of a regional authority. SR Consulting is a business consultancy with considerable public sector experience. The exercise included important aspects of public sector bidding that we thought would be useful to share with you. The Mercury / SR Consulting collaboration was particularly effective for our client because we brought dual experience of the criminal justice and bidding disciplines. Our client was an existing provider of the services that the public authority needed, but had to demonstrate its ability to scale up its operations to accommodate a much larger geographical scope. The essence of the proposal was to show how our client’s experience would support the authority’s requirements and enable upscaling of operations. Our role was to help draft the bid and review material already prepared. Write about things that matter most to your client. It may seem obvious, but responding to a PQQ and Invitation to Tender (ITT) requires a clear understanding of how the procurement process operates and a well-defined approach for how to respond. You need to consider carefully what your client wants to read, and develop your arguments around that, rather than around what you want to tell them. Make sure you’ve studied the scoring criteria for the PQQ or ITT, focusing on the specific points stated by your client, and giving as much detail as practicable to support your claims of credibility. Be sure that you understand the deliverables required and their implications for your resources, bidding / operational timescales, contract commitments, etc. These should all be referenced in the client’s PQQ / ITT documents issued to you. This is just as important when you’re an incumbent provider and you’re bidding to secure a repeat contract. I know what you want and here’s something that will meet your needs directly. Here’s what I have to offer. How much of it do you want? Whether you’re an incumbent bidder or a new one, the steps in Figure 1 will ensure you focus on your client’s priorities, and take your client to a better position. Figure 1: Key stepping stones of bidding must be applied to capture your client’s attention. Show how your proposals take your public sector client to a better position than its present one. Make bid assessment easy for your client. Think about the elements shown in Figure 2 when you next prepare a proposal for work in the public sector. Figure 2: Excellent bids come from attention to a targeted writing style. Follow these key requirements when you next prepare a proposal for your must-win public sector client. In a recent article, we shared essential pointers for keeping your client engaged and making bid assessment easy. Let’s now consider more about how to write persuasively, which is clearly a critical aspect of bidding. It’s made particularly important due to the limit on the number of words, pages or characters allowed in responses to bid questions. When your scope for how much you write is restricted, you have to use your words wisely and write persuasively. Why is your client procuring the services? What business need has to be fulfilled? What will your client not be able to achieve in the absence of the services? Demonstrate that you understand the broader background to your client’s procurement exercise, and why it’s important to the commissioning authority’s business. Do you know who will be reading your submission? What are their backgrounds, corporate interests, expertise, responsibilities, etc? Ensure you include reference to specific issues that matter to the people involved. It is unlikely that all readers of your submission will have the same specific priorities. They are likely to be varied, e.g. commercial, operational, safety. Is it clear to you how your client has achieved its goals so far? What difference will the new – or renewed – services make? Show that you appreciate the magnitude of the change / benefits to be introduced, keeping the tone of your bid proportional to the improvements sought by your client. How does your experience make you a good choice of supplier for providing the services? What sets you apart from your competition, to ensure you won’t be viewed as ‘just another supplier’, offering little of additional value? Focus on your differentiators that set you apart from your competition. This is particularly important when you’re an incumbent bidder, often regarded by clients as not providing sufficiently evolved and innovative ideas. To whom does your client report? 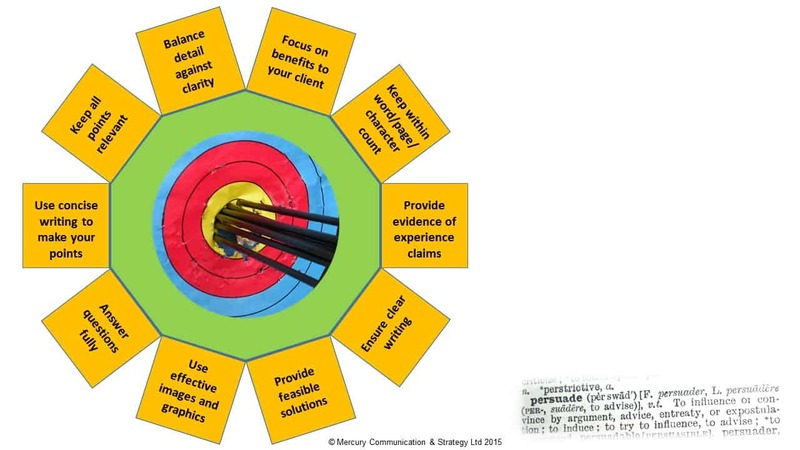 What targets has your client been set? What is the priority order of the targets? Think about the wider context of your client’s procurement exercise. You’re bidding to individual people, but what pressures are they under? How can your bid help them look good? Take the opportunity to validate their wise choice to include you as a bidder. Table 1: Asking yourself some key questions is essential during your bid planning. Write about issues that matter most to your client. For our client bidding to provide victim-centred services, it was important to demonstrate understanding of the demographics of the contract region. This was because the region covered a large geographical area, comprising various backgrounds of individuals, families, crime victims, gangs, etc. It was particularly important for our client to show this understanding because the contract was for a much larger region than that in which our client had experience, so upscaling for more diverse demographics was central to our persuasion strategy. Our case was supported by our client’s extensive experience of interfacing with victims of various crimes (e.g. domestic violence, child sexual abuse, etc) and with statutory bodies (e.g. Crown Prosecution Service, Ministry of Justice, etc). Our client’s required growth, for providing the extended services, coincided with the public authority’s taking over, from central government, of the responsibilities for the services. This dual transition demanded particular attention to the issues in Table 1 for developing our persuasive arguments. The procuring public authority stated its present arrangements in the ITT, so we knew the mechanisms upon which expansions and improvements were sought. Much of our work with our client included structuring the argument about collaboration with its existing and potential partners to deliver the broader service scope. The public authority viewed consortia and joint ventures as an important way to benefit from the market’s expertise. Consider this when you prepare your next public sector bid. The drive for innovation, combined with cost efficiencies and economies of resources, is becoming an increasingly attractive way for public clients to satisfy multiple challenging requirements. Since this bid was for services to members of the public, it was important that we demonstrated our client’s sound understanding of the Public Services (Social Value) Act 2012 and its implications. Specifically, we showed how our client’s proposals would support the public authority regarding economic, social and environmental wellbeing in connection with this public services contract. These were not scored equally and each had specific points of detail in the ITT and contract documents. When reviewing the bid, assess it against the scoring criteria, preferably asking someone not involved in the bid preparation to critique the submission. A ‘fresh pair of eyes’ is invaluable at this stage because it’s easy to become ‘bid blind’ after working on a submission intensively for some time. Ask your reviewing colleague(s) to consider the following issues when reading your bid responses. There are various other issues that we consider when we review bids, based on our experience of working for clients bidding in the public sector. Is your submission compliant with stipulations in the ITT and any other relevant documents? Do your responses meet the evaluation criteria, including word, character or page limits? Does each answer address the specific question asked, rather than reading as a generic response? To what extent does each response tell a convincing story? How well do the responses promote your win themes and competitive discriminators? Has the bid mitigated issues that might be perceived by the client as weaknesses? Is there sufficient evidence to substantiate claims of credibility? Does the overall bid avoid inconsistencies between sections, e.g. procedures, names of documents, acronyms? Is the submission free of spelling and grammar mistakes? Having your bid reviewed, by someone not involved in the writing or planning, is effective because it will be easier to spot non-compliances regarding the above items. As always, we’re keen to know what you think of bidding processes, so please share any insights that you think will contribute to the discussion.